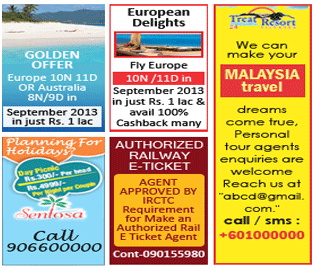 THROUGH BOOKCLASSIFIED.COM COMPANY/AGENCY YOU CAN BOOK CLASSIFIED ADVT.FOR NEWSPAPER ACROSS ALL CITIES,STATES OF INDIA. Bookclassified.com agency/online portal company is one of the best newspaper classified advertisement booking services company across all cities,states of INDIA with easy online payment procedure. Bookclassified.com agency/company online portal website is mobile friendly optimised which helps our users to successfully visit our website from mobile devices, tablets,pc with good internet connectivity and successfully book their ads in all leading newspaper across all cities,states of india through our company. TEXT classified is grouped under specific heading classifying the product or services being provided such as TO LET, SALE, ASTROLOGY etc. Cheaper in cost. Charged per lines/words or per character. Can be highlighted with variants like BOLD, BORDER, COLOUR etc. DISPLAY classifieds are a bit costlier but are more prominently visible. Rates are charged per Sq. Cm. Logos, Images, different fonts etc can be used. Bookclassified.com agency/company is authorised company for newspaper, all editions circulated across all cities,states of INDIA best classified ads, classified ads, online classified newspaper ad, classified ads in newspaper, newspaper display and text classified ads,ads,newspaper online display and text classified ads, newspaper classified advertisement, newspaper ads, online newspaper classified ads booking services,ads booking services,newspaper online display and text classified ads booking services, online classified ads booking services,advertisement booking services, online classified advertisement, online newspaper classified advertisement, book newspaper classified ads, book newspaper classified ads online, release newspaper classified ads, release newspaper classified ads booking online, classified ads booking in newspaper ,times of india newspaper classified ads booking services, samaja newspaper classified ads booking, prameya newspaper classified ads, new indian express classified ads booking online services, obituary classified ads in newspaper,orissa newspaper classified ads booking services company, bhubaneswar newspaper classified ads booking company, cuttack newspaper classified ads booking company, kolkata newspaper classified ads booking company, guwahati newspaper classified ads booking company, bangalore newspaper classified ads booking company, tamilnadu newspaper classified ads booking company, kerela newspaper classified ads booking company, hyderabad newspaper classified ads booking company through bookclassified agency,maharastra newspaper classified ads booking company , himachal pradesh newspaper classified ads booking company , business classified ads booking in newspaper, online display and text classified ads booking in newspaper with good discounts,etc. Best newspaper classified advertisement booking services and deals for all newspaper editions wisecirculated across all cities,states of india. through Bookclassified.com company/agency. 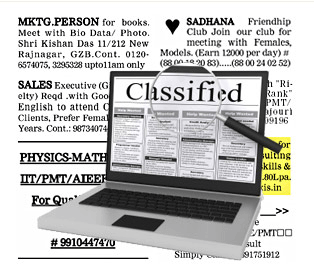 Bookclassified.com is top authorised advertisement booking agency/company for newspaper all editions for all cities,states of india best classified advertisement,Radio advertisement,Television advertisement,Digital advertisement,Cinema advertisement,Newspaper text classified advertisement ex:Affidavit, Business, Sale/Purchase, Matrimony, Tolet-Rent etc., Newspaper display classified advertisement ex: lost/found, obituary, missing etc, Times of India matrimony ads, Times of India epaper booking, samaja classified booking ad, Dainik Bhaskar online classified, Dainik jagaran online classified ad booking, Eenadu online classified ad booking, Newspaper classified online booking, Samaja matrimony booking online, Prameya sale classified booking, Hindu classified ad etc. All advertisement needs booking services across any channel, medium, Newspaper, online services, with easy online payment option mentioned in our website www.bookclassified.com. These services are offered by our company Bookclassified.com.